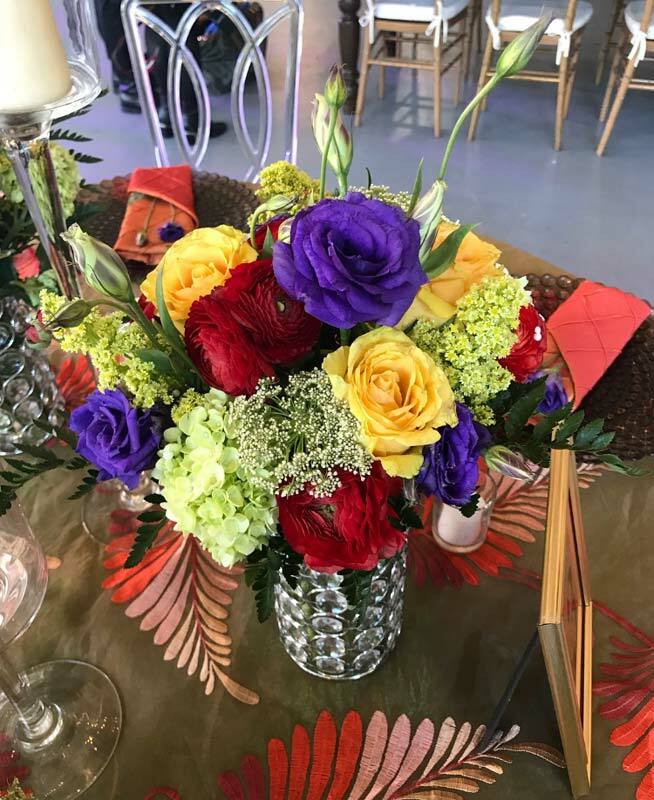 1) Provide your own containers and candles – this will help lower the cost of your arrangements as well as lower the delivery fee because your florist won’t have to return at the end of your event to pick up these items. 2) Try to avoid the weekends before and after Valentine’s Day and Mother’s Day — The growers where your florist purchases their flowers from will end up doubling and sometimes tripling the cost during Valentine’s Day and Mother’s Day, which means these costs get passed down to you. 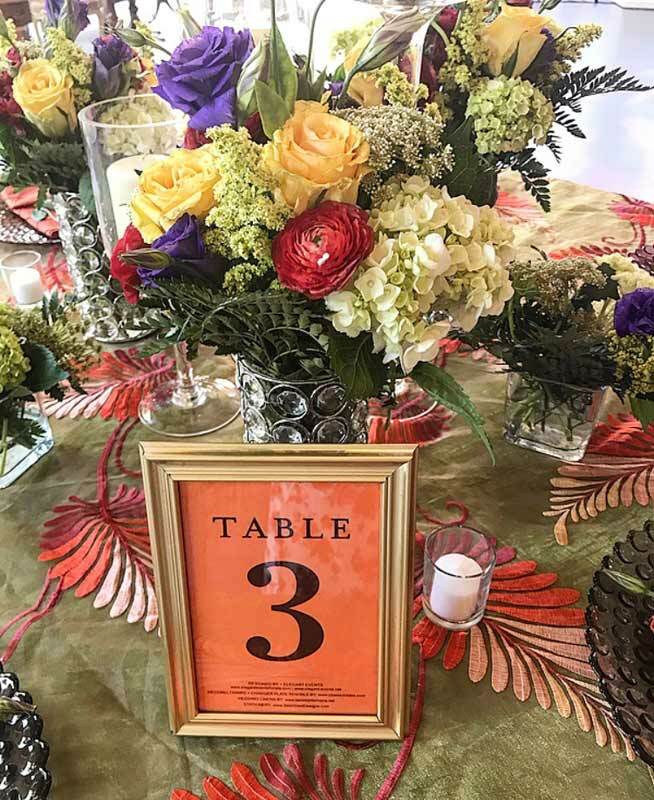 3) Repurpose your flower arrangements — If your ceremony is at the same venue as your reception you can get a WOW look for your ceremony by repurposing your beautiful reception flowers as ceremony aisle décor by simply asking your florist to supply pedestals for the ceremony. 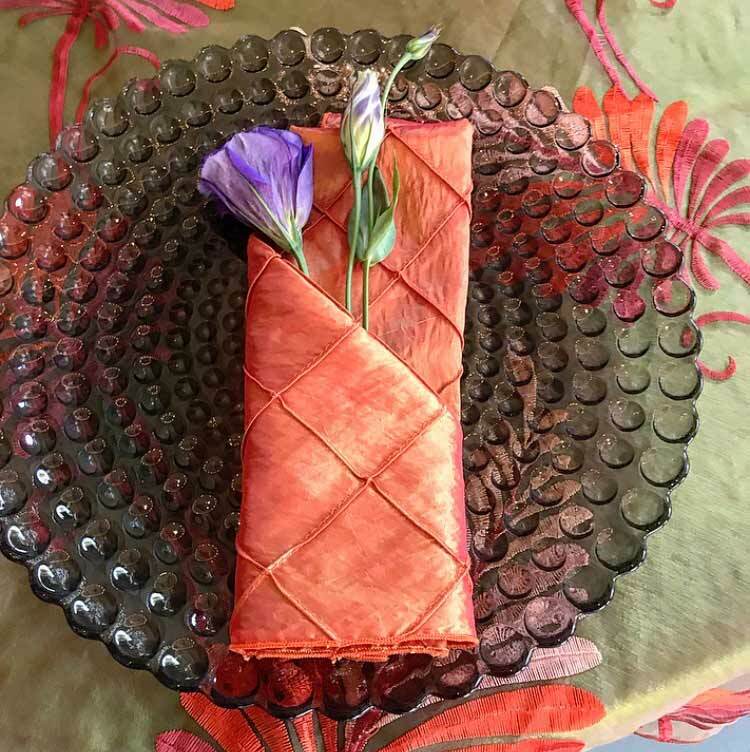 4) No sweetheart or head table centerpiece is necessary — You and your partner are the centerpiece, so there is no need to pay for one. 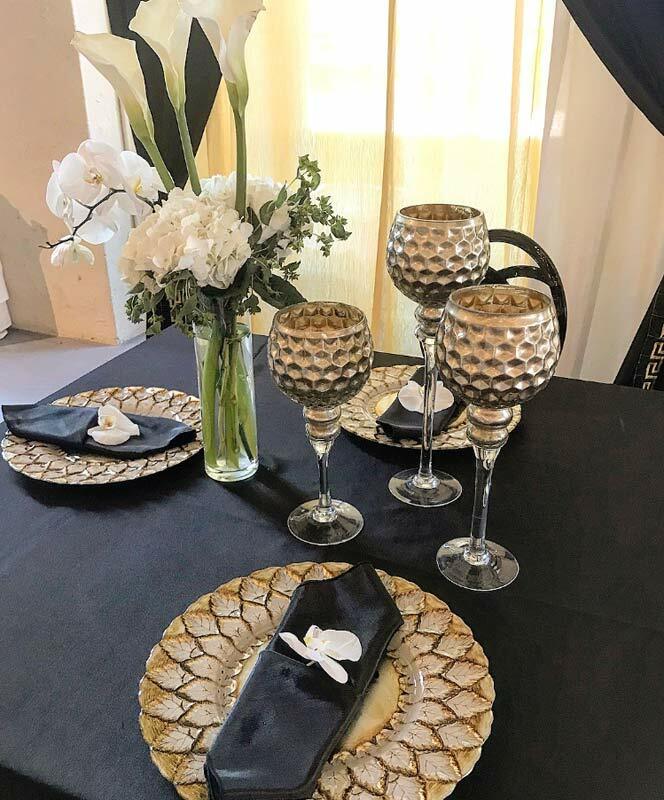 Use that beautiful crystal vase you received as a shower gift to display your bridal party bouquets surrounded by those candle holders you provided as décor. 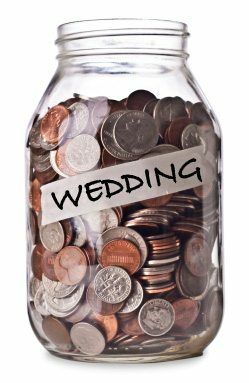 We hope these tips will help you save the money you were looking to save for your big day! Thursday, July 19th we had the opportunity to be apart of The Big Fake Wedding in Philadelphia. 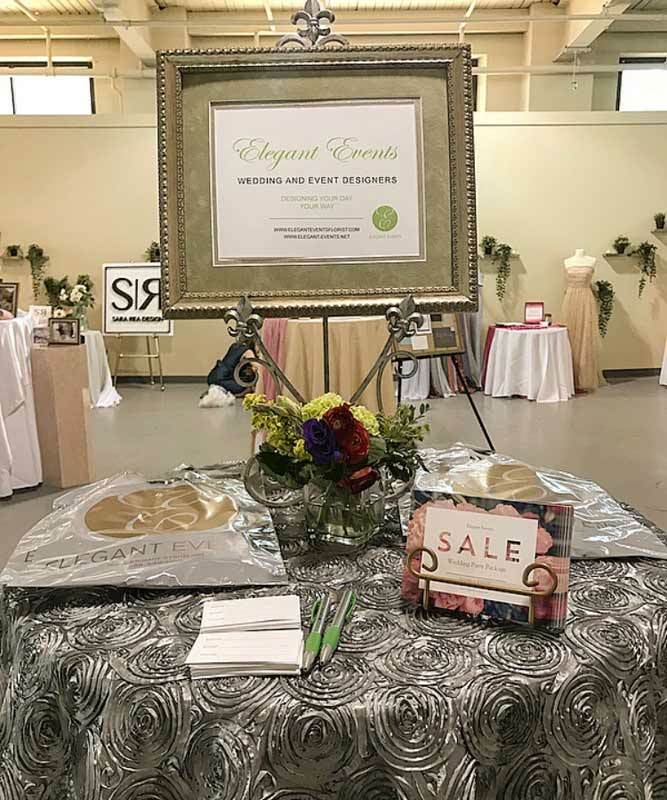 This event was a “mock” type wedding that helped connect couples to the best wedding vendors in town. It was our honor to design the head table, as well as two other guest tables in the reception area. Three different tables, with three different themes. 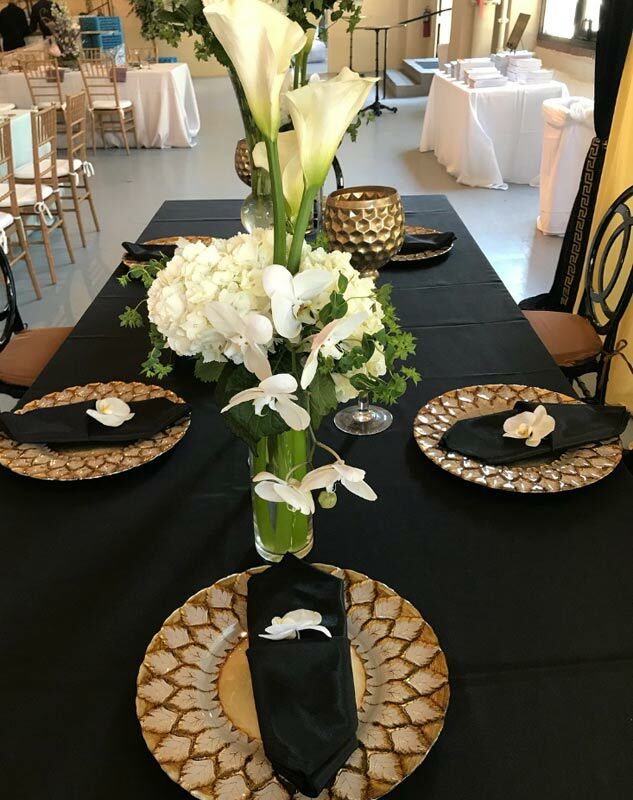 Head table: The backdrop of the table was draped with ivory and gold fabric with black and gold accents around the edges and down the middle. 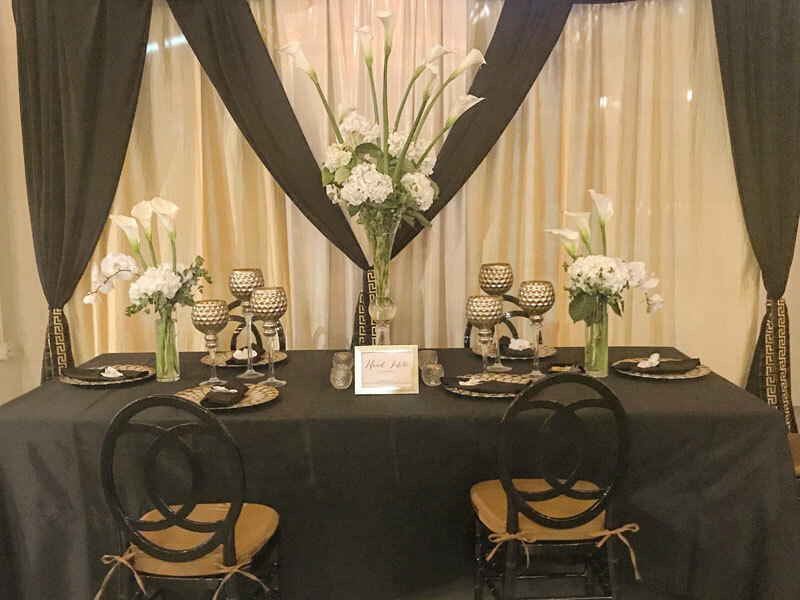 The head table was covered with black floor length linens and surrounded by black chiavari chairs with gold pads. Dinnerware consisted of gold, glass plates and flowers tucked in a black linen napkin on top. 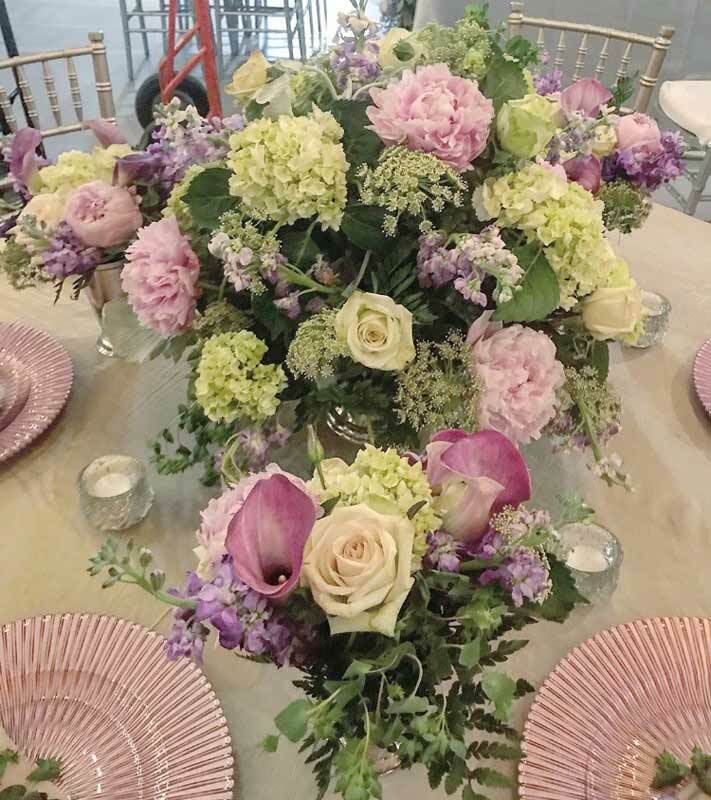 The centerpieces was an assortment of three arrangements with hydrangeas, calla lilies, and orchids. For accent, we added clusters of tall gold goblets and tea light candles. 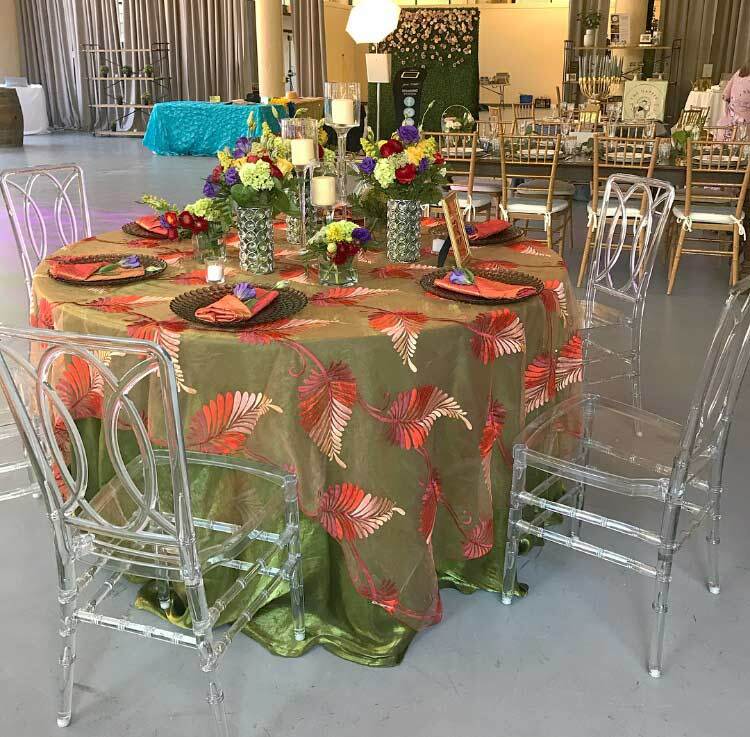 Guest Table #1: The theme of our first guest table was “tropical.” Covered in a floor length, silk green linen and a brightly decorative table toper, this colorful table caught guests eyes. Clear chiavari chairs surrounded the table, while orange linen napkins sat on top of beautiful plum glass dinner plates. 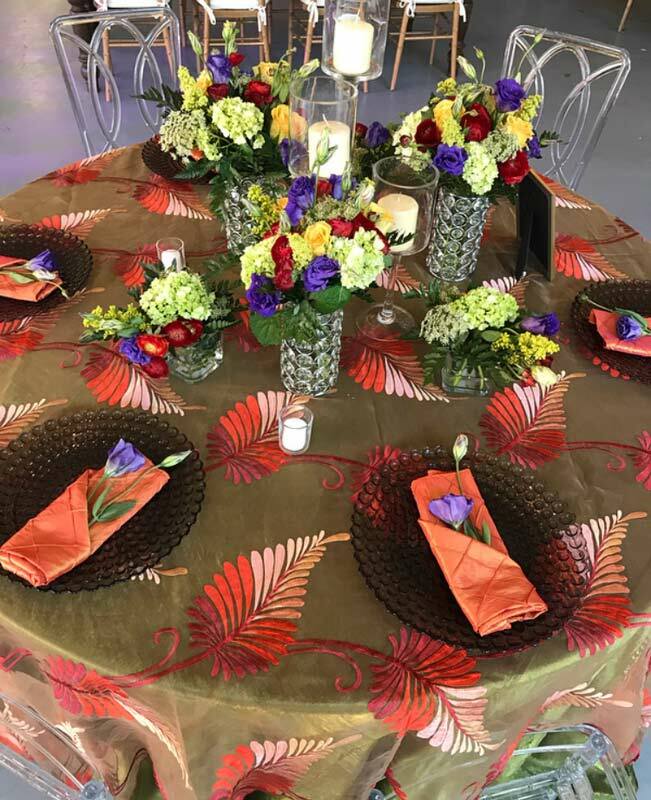 We topped this table with a cluster of brightly assorted floral arrangements. Guest Table #2: Our second guest table was gave more of a raomantic spring/summer theme. 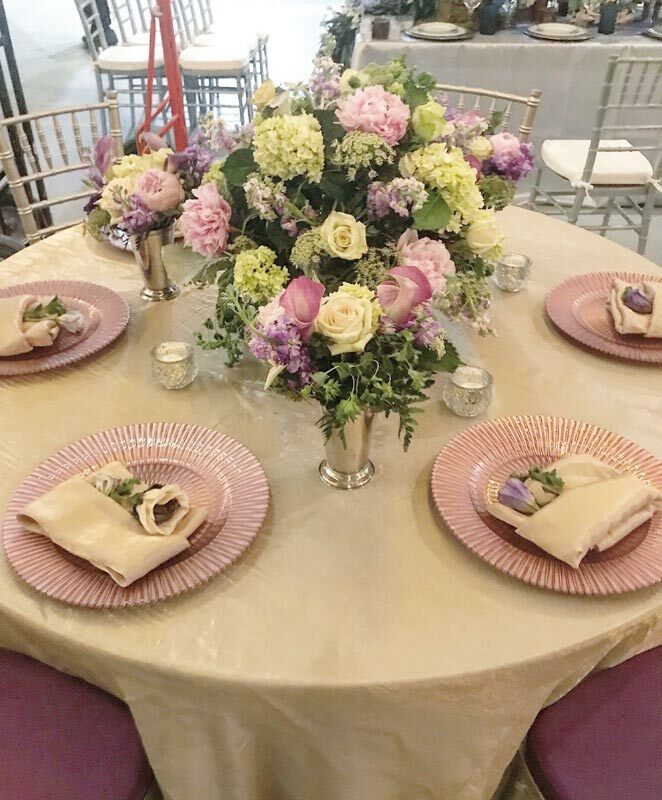 Lined with floor length, ivory silk table cloths, the table was then surrounded by silver chiavari chairs with purple padded seats. 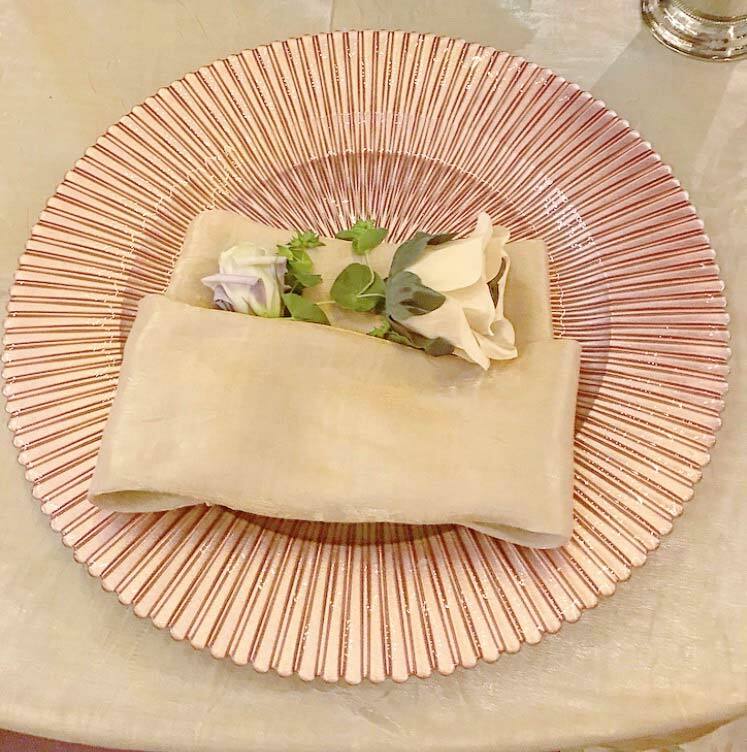 Beautiful glass, rose gold plates were placed at each setting, topped with silk table napkins. Centerpieces consisted of a cluster of lavender, pink and ivory centerpieces. Overall, the night was an absolute success and we are so grateful for The Big Fake Wedding and all the amazing vendors that participated in this event. A special shout out to the following vendors who helped create our beautiful guest tables. 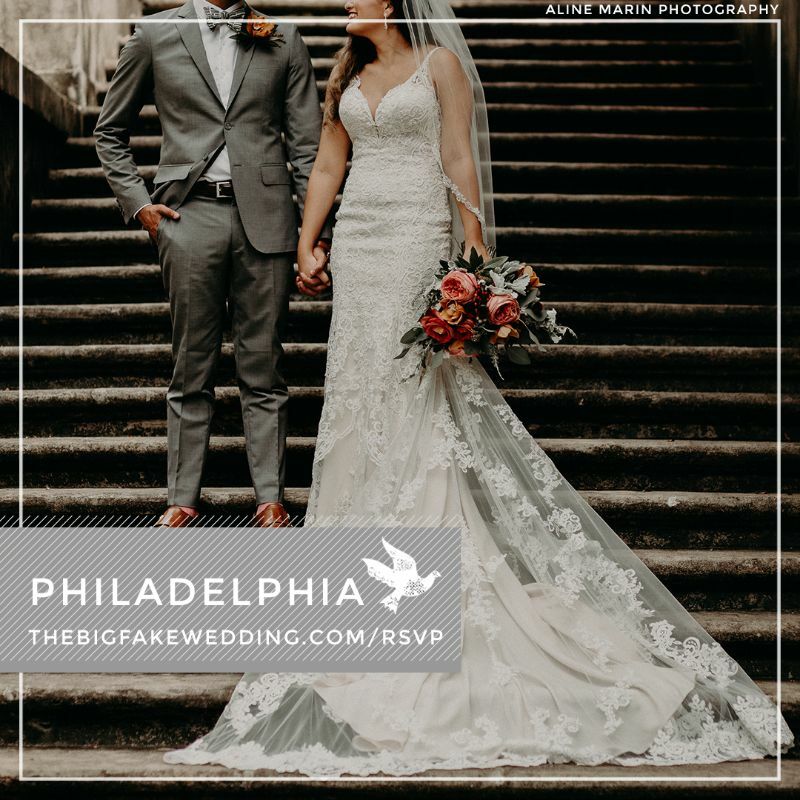 Don’t forget to register for The Big Fake Wedding on July 19th at the Moulin in Philadelphia, PA. What is The Big Fake Wedding? This is a “mock” type wedding that will include some of the best wedding vendors around the Philadelphia area. 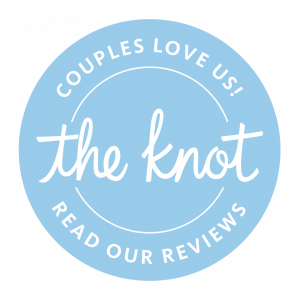 This event helps create an opportunity for vendors to showcase their services to attendees just as they would at a real wedding. Doors open at 6:30PM and the party will go on until 9:00PM. Each ticket include small appetizers, a signature drink and a swag bag. 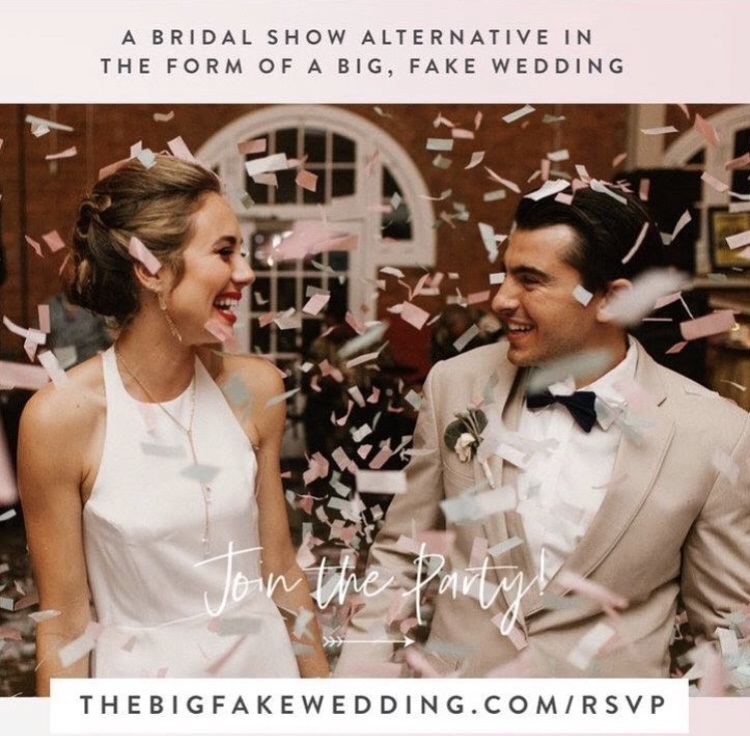 Elegant Events is excited to announce their participation in the The Big Fake Wedding on July 19th from 6:30PM – 9:10PM at the beautiful Moulin at Sherman Mills in Philadelphia, PA. This will be a “mock wedding” that EVERYONE is invited to. This event will help connect you to the best wedding vendors in town, plus it will be a fabulous time! We are also currently offering two complimentary tickets to attend. These Golden Tickets are “while supplies last” so you’ll need to be sure to register as soon as possible to be guaranteed a spot. 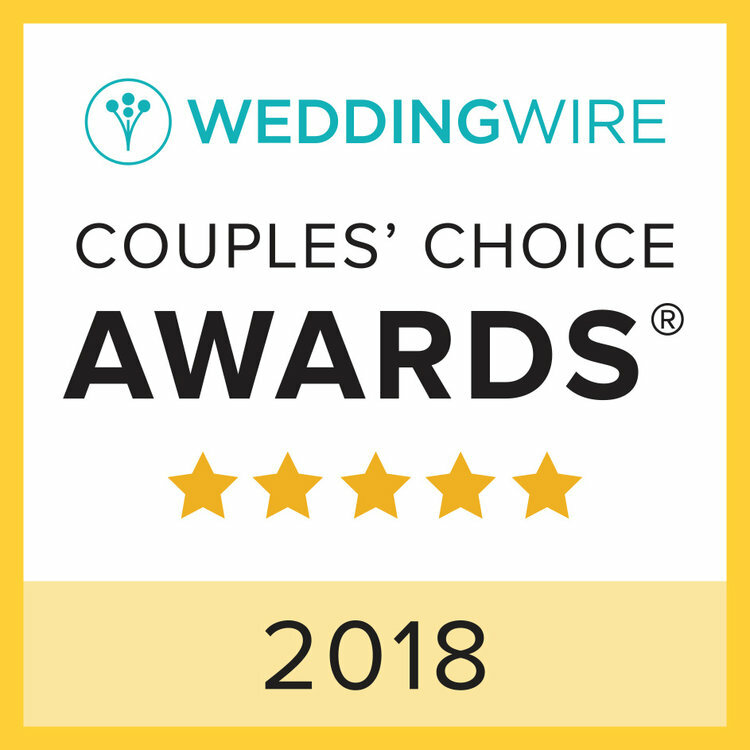 To register, go to http://thebigfakewedding.com/rsvp/, choose the event, enter the promotional code “TheBFWLovesMe,” adjust the quantity to 2 and click register. Contact us at eleganteventsflorist@gmail.com or 215-728-1381 if you have any questions!